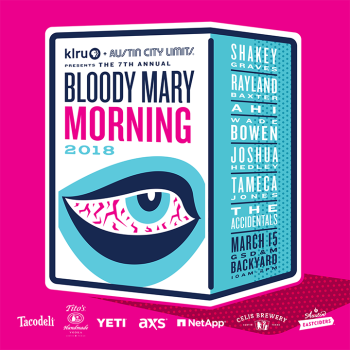 Join Austin City Limits and KLRU-TV, Austin PBS at the 7th Annual Bloody Mary Morning during SXSW on Thursday, March 15 from 10 a.m. until 2 p.m in the GSDM courtyard. 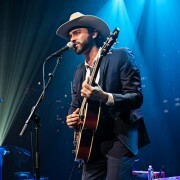 In keeping with the Austin City Limits tradition of bringing audiences “Great Music. No Limits,” this year’s party includes some of music’s most exciting up-and-coming artists: Austin roots rocker Shakey Graves, Nashville honky-tonker Joshua Hedley, Michigan folk rockers the Accidentals, Austin soul powerhouse Tameca Jones, Waco’s Red Dirt country rocker Wade Bowen, Canadian soul troubadour AHI and Nashville country artist Rayland Baxter. Even better, you can listen to music while enjoying free (while supplies last!) bloody marys from Tito’s Vodka, craft beverages from Celis Brewery and Austin Eastciders courtesy of Brown Distributing, and breakfast tacos from Tacodeli. Bloody Mary Morning is brought to you by our friends AXS, NetApp and YETI. So make it a Bloody Mary Morning like Willie would want you to! You don’t need to be a SXSW badgeholder to attend – Bloody Mary Morning is free and open to the public. Wear your ACL swag for a chance to win a YETI Rambler. You can RSVP here. Please join us!